In just a few days, the African American Children’s Book Fair will celebrate its 21st anniversary. Founded by literary publicist and advocate Vanesse Lloyd-Sgambati, the important festival has grown from a small event at a local department store in Philadelphia to one of the oldest and largest African-American children’s book fairs in the country. Each year, more than 3500 people attend. Drawing children, parents, caregivers, educators and kidlit lovers from around the country, the fair will take place 1-3 p.m. on February 9 in the gymnasium of the Community College of Philadelphia. Want to attend? Try to get there early. Every year, people line up before the doors open for the annual celebration featuring some of the top talents in the children’s book industry. As always, there will be plenty of books to buy and authors and illustrators on hand to sign them. There are special giveaways too. It’s a magical day that puts African-American book creators in the spotlight and brings them together with kids. What does that milestone mean to you? Twenty-one is a significant hallmark in one’s life. In real life, it is the official age of adulthood. But in the literary world, it is a major milestone, because most book fairs don’t last more than five years. I attended a seminar this summer in New York and in the conference packet was a timeline of significant events in African-American literary history. It went all the way back to the 1800’s listing the first African-American children’s book published and people like Langston Hughes who contributed to the movement. One of the entries of significant events was THE AFRICAN AMERICAN CHILDREN’S BOOK FAIR established in 1992. Wow. How has the book fair changed over the years? When the book fair was created, it was a traditional book fair with authors/illustrators just signing books. The focus then was to promote and preserve African-American children’s literature. Our mission was to get people reading, but also buying books. There is no African-American children’s book store in the region and retailers that do carry children’s literature have limited amount of shelf space, so our books are in short supply. The longer the book fair was held, the larger the attendance. The demand increased because the need was greater in the community. Many schools and libraries don’t have the financial resources to provide the most up-to-date children’s literature. Parents also understand that when you tell a child to cut off the electronics you’ve got to offer them an alternative. Another thing that has changed for me is a better understanding of the consumer base. In general parents and caregivers, no matter what their social economic level is, all want their children to succeed. The attendees come from all sectors, but making sure their children have books in the home that reflect positive images of themselves is a common goal. As the years went by, I recognized that my skills as a literary publicist (I’ve produced literary campaigns for a number of New York Times-bestselling authors of books for adults) was beneficial for the book fair, but also for many of the authors/illustrators who participated. So I set up media opportunities in television, print and radio. That exposure gave this pool of exceptional literary talent a broader platform to promote their works. It also gave the consumer a more personal look at the creativity in the African-American children’s literary community. As sponsors came on board, I was able get them to support buying books of the authors/illustrators. So we now have corporate sponsors like NBC10 (the local NBC affiliate), PECO an Exelon Company, McDonalds, Comcast, and Health Partners, who as a part of their sponsorship purchase books of our participants to give away to children attending the event. So the authors/illustrators come into the book fair pre-selling their books. But there is a brisk business in the book fair area. Consumers wait in long lines with an armful of books to purchase. They’ve come to buy. Our organization is one of the top sellers in the country of African-American children’s books. We have one of the widest selections of African-American children’s books for preschool to young adult. As one woman said to me there are two times a year she waits in lines – Black Friday and the African American Children’s Book Fair. What are some of the highlights of this year’s event? Our sponsor pre-purchase book event is one of the hallmarks of the event. We are on a mission to get books back in the home. Giving a child a book that reflects their image is a great way to get them on the path to a lifelong journey of reading for pleasure. It starts the process of buying books. It’s like you get a sample of something delicious and keep going back for more. That sample leads to purchasing the item. We are getting corporate America directly involved in the literary movement. There aren’t many book fairs that focus on African-American children’s book authors and illustrators. But we take it to the next level. Our educators’ resource area provides consumers with the latest catalogs from children’s book publishers. These are the same catalogs that are used by booksellers. This enlightens the consumer. The NBC10 Reading Circle is an established book giveaway program. It is two-fold – a child gets to meet the person who wrote/illustrated the book. We know as an adult that an autograph book is treasured. We create that same experience for the children who attend the event. The second part is the ownership. This encourages the reading process. PECO, HEALTH PARTNERS and COMCAST will give away books of select authors/illustrators to educators for use in the classrooms. Syndicated cartoonist Jerry Craft will offer a cartoon workshop sponsored by PECO an Exelon Company. Each child will receive a free book. David Miller, author of Khahil’s Way, will lead a bullying workshop. Regina Brooks, author of Writing Great Books for Young Adults: Everything You Need to Know, from Crafting the Idea to Landing a Publishing Deal, will host a teen seminar. Cheryl Wadlington, author of The DivaGirl’s Guide To Style and Self-Respect, will host a self-esteem workshop. Why is it so important to shine a spotlight on these children’s book creators? Our mantra is PRESERVE A LEGACY, BUY A BOOK. This may be unsettling to some, but the only way great books continue to be published is if consumers buy them. The demand dictates the supply. What do you hope visitors to the book fair gain from attending? First and foremost, I want children at an early age to enjoy reading……………..make reading for pleasure a daily part of their lives. Another goal is to make consumers understand the African-American literary marketplace and the importance of buying children’s books. Our vast selection gets the consumer on the road to establishing a home library. My life has been empowered and enriched through African-American children’s books. What’s your favorite part of the fair? The excitement of a child receiving a book and finding a corner to read on the spot. Sometimes the media paints a picture of doom and gloom about the children in our communities, but come to our book fair and see the future of our nation. Uplifting. I have no doubt we will be alright. Just keep them reading. The great literary movement in this country. When you attend my book fair, it refutes the idea that African-Americans do not buy books for their children. Our attendees start lining up at 10 a.m. for entrance into an event whose doors open at 1 p.m. Adults who attended as children are now bringing their children. People who came as parents are now bringing their grandchildren. Time after time, I meet people who tell me stories about how the books they found at our book fair transformed their lives. The talented authors/illustrators who make my work possible. They are true stars in our community. What are your tips for others who want to start an African-American children’s book fair in their area? Start small but keep it focused on books. Selling other types of merchandise takes away from the real purpose of the event. It is a book fair. If you cast your net, you would be surprised to find out how many published authors are in your area. Start with a few. But again, keep it focused on the books. Check out your local bookstores to see if they will partner with you. My company, The Literary Media and Publishing Consultants, is an advisor to authors/illustrators, publishers and corporate entities interested in literacy. We can pull together events anywhere in the country. As your book fair has grown over the years, have your dreams for it grown too? I want to take this show on the road. Every city should have a book event that celebrates reading…celebrates African-American children’s books. And of course I want to share this experience with the WHITE HOUSE WITH OUR PRESIDENT AND HIS FAMILY. My dream event is at 1600 Pennsylvania Avenue……………..Do you hear me Mr. President?……….A Book opens Up a world of Opportunities.We want the opportunity to showcase our literary talents……….. 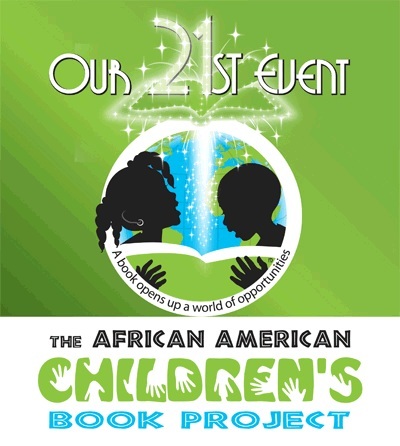 Learn more about the book fair and find out which authors and illustrators will be there at http://theafricanamericanchildrensbookproject.org/.